Athletics and Fitness staff strive to make healthy living easy, accessible, and affordable for all Tukwila residents, day-time employees, and visitors. A variety of fitness classes, along with a fitness room containing cardio and weight equipment, is available to everyone seeking wellness opportunities. 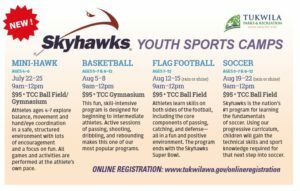 For more information view the seasonal activities guide or click on any of the links below. Month to month, 10 and 20 visit punch passes, and drop in (just $5) fitness membership passes provide access to classes and the fitness room at the Tukwila Community Center. Staff also works with local businesses to create fitness memberships tailored to meet employee needs. Fitness memberships are affordable and designed to meet a variety of interest to make healthy living an easy choice. 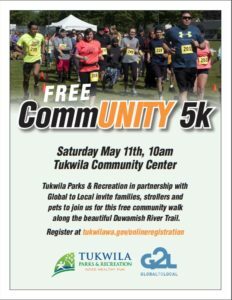 Fitness memberships may be purchased in person at the Tukwila Community Center and will be available online in the near future. Please note, the Tukwila Community Center Fitness Room is closed on all major holidays. Children may not be left unattended. Weekends are exempt from all peak hours. Several personal trainers are on staff to assist patrons with a variety of fitness and wellness goals. Trainers work with individuals to design and tailor programs to maintain or enhance general health and wellness, improve muscle tone, develop cardiovascular endurance, and more. Stop by the Tukwila Community Center to learn more, read trainer profiles, and schedule a meet and greet.